Four short horror novellas from the author of Horns and The Fireman. 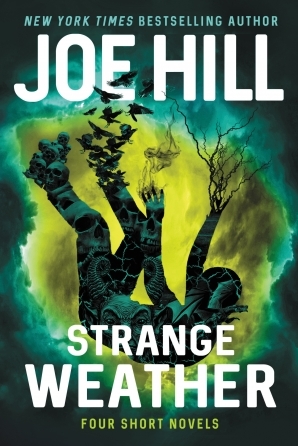 Joe Hill writes in Strange Weather that the beauty of the novella is in its 'all killer, no filler' length, and certainly he makes the most of that mantra in four tightly told tales ... The Weather quartet unleashes a perfect storm of styles, from a slow-burn thriller to ethereal sci-fi, all told with a consistently strong voice ... Hill takes on police brutality and America’s passion for guns in an insightful way here [in 'Loaded'], leading up to a gut punch that will stick with you as you move to the other stories ... Hill’s Strange Weather is an intriguing companion of sorts to his father's Different Seasons. And while there’s no obvious thematic ties among his genre mash-up, Hill whips up emotional moments in all four that strike like lightning and thunderously rumble your soul. These tales are terrifying and compelling, filled with intense anxiety throughout, but it is that final story, set entirely in the real world, that is the most menacing of the bunch. After getting two 700-plus-page novels in a row, fans will be thrilled to take in Hill’s malevolent mind through these masterfully crafted single-sitting reads reminiscent of the very best of the short works by giants of the form like King, Gaiman, and Miéville. Hill is not only maturing as a writer of relevantly chilling tales but he is also emerging as a distinct voice for our complicated times. A striking selection of novellas ranging from the playfully apocalyptic to the wickedly political ... It’s telling that 'Aloft' and 'Loaded' are Strange Weather‘s strongest stories: their ambiguous endings allow them to live past their last pages. That one is wacky and wonderful while the other’s twisted tragedy proves all too easy to believe evidences the tremendous diversity of this collection. If NOS4A2 and The Fireman were Hill’s Salem’s Lot and The Stand, then this, dear readers, is his Different Seasons: a demonstration of his range and readiness to tell the hell out of any tale, be it supernatural or straight, silly or completely serious. What did you think of Strange Weather?